Let us once again make everybody drool sporting our handmade beaded jewelry bracelet, Shamballa Bracelet. We will learn how to create a beaded jewelry worn by renowned celebrities all over the world, and has the latest height of fashion that has a Spiritual consciousness. Shamballa or Shambhala is a symbol of spiritual philosophy inspired by ancient traditions of Buddhism, meditation and yoga. The Sanskrit word Shamballa means a place of peace, tranquility, happiness and the root of human goodness and aspiration. because it’s exquisite and it never runs out of style. Are you ready to create your very own Shamballa Bracelet now? You can coat the tip of your central cord with a nail varnish or a glue to stiffen the end and stop the thread from fraying while threading your beads. Then allow it to dry before you begin. Shamballa Bracelet’s style of knotting is usually known as Macrame. If you enjoyed making the Shamballa Bracelet, you can also check how to Finish Off Macrame Knotting. Pretty easy isn’t it? How about checking other beaded jewelry making inspirations? adaptable to many sizes and shape beads. Here is another beaded jewelry making tutorial. You can creatively use different colors according to your style. We hope we have given you these video tutorials exciting and interesting. Keep posted for more! 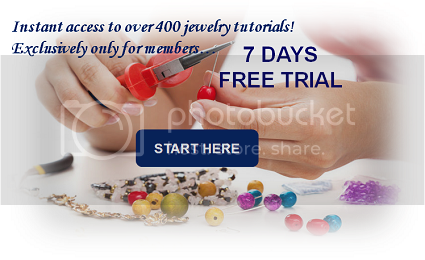 Join us as we feature jewelry making tutorials everyday!